What could be more important to a business than understanding its customers, competitors, and markets? Managers need a coherent view of these things. With consumer research, product management, competitive intelligence, customer support, and management information systems housed within separate departments, managers struggle to find the information they need. Integration of research and information services makes more sense. This book is about business strategy. It argues for an integrated, strategic approach to information. It draws upon economic research, provider and client surveys, and in-depth interviews with over forty information experts. It provides insights about the nature of research and the demand for information. 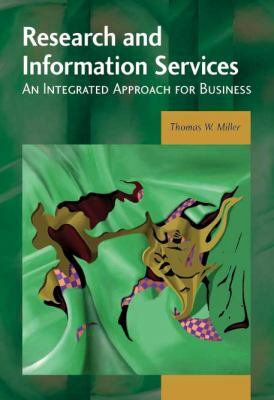 With discussion of information product positioning and pricing, as well as technology trends, it represents a critical resource for buyers and sellers of research and information services.Miller, Thomas William is the author of 'Research and Information Services: An Integrated Approach for Business', published 2007 under ISBN 9780972729727 and ISBN 0972729720.